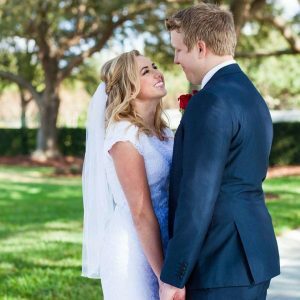 We supply unique and quality gowns from established vendors from reputable companies that we have worked with for decades. We work hard to keep up with all of the latest styles and fashion trends, as well as keeping a good supply of modest, temple-ready wedding gowns. We want brides and their families to have a wonderful experience through the entire process of finding and purchasing your perfect gown for your perfect day. We love what we do almost as much as we love seeing a beautiful bride on her wedding day. Visit us today!